The ticket expressly promised that I was going to "The Event of The Year." 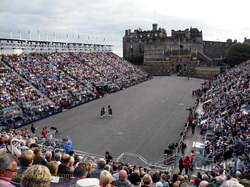 Indeed, the Royal Military Tattoo has an international reputation and is widely regarded as the premier event of the Edinburgh season. This is no small accomplishment considering the festivals and the numerous other events that take place in the Scottish capital over the course of a year. Of course, this Tattoo has nothing to do with body art. The term "tattoo" is believed to have its roots in the drum call that would summon soldiers back to barracks at the end of the day. The Edinburgh Tattoo is, however, a combination show, concert, display and spectacular with music, marching, dancing, theatrical lighting and even fireworks. 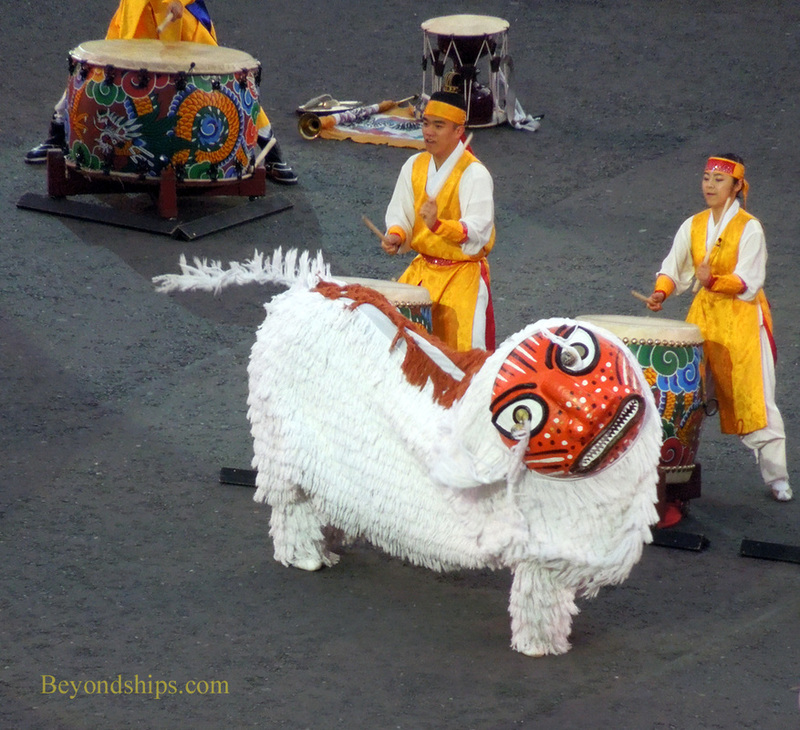 Although it is a military tattoo, the show is not exclusively marshal in character. Many of the performers are active duty military, not just of the United Kingdom but of a number of other nations. However, there are also non-military performers including artists who perform traditional dances and music from their homelands. About 1,000 people perform in the Tattoo. It is considered an honor, not only for the U.K. artists but also for the artists from other nations, to perform at the Tattoo. As you would expect, the Edinburgh Tattoo has British military pageantry (see above) but it also has an international side as well (see below). Above: The stadium from Edinburgh Castle. Above right: Shortly before the performance. Befitting a royal event (Princess Anne, the Princess Royal is the patron), the Tattoo takes place in front of Edinburgh Castle, which is a royal castle. Located atop the remains of an extinct volcano, the Castle offers commanding views over the city. A temporary stadium is erected each year on the Esplanade, which can seat some 8,600 people. It is built so that there is seating on three sides of a long rectangular parade ground with the Castle on the fourth side. Performers enter the parade ground through the Castle Gate. In addition, the Castle serves as a backdrop during the performance with colored lights and images projected upon it and fireworks launched from its interior precincts. Even though the Tattoo is reserved seat, a long line to get into the stadium forms considerably ahead of the performance. It winds its way through the narrow streets leading to the Castle and down the hill. The concern is that if you do not join in this line, you may not be able to get to your seat before the show begins. Once the doors open, the line moves amazingly fast. Despite the fact that my place on the line was a third of the way down the hill, I was able to navigate the narrow streets, find my seat and settle in well before the performance began. Just prior to the performance, a bagpiper met with various dignitaries down on the parade ground and was given a ceremonial drink from a silver chalice. He would be the lone piper who would appear on the battlements of the Castle at the end of the performance. After this ceremonial drink trumpeters located in the grandstands played a fanfare signaling the beginning of the performance. Above: Approaching the stadium before the performance. Above right: A ceremonial drink. Right: Trumpeters play a fanfare signalling the start of the performance.